ZNF’s system is very simple. Your clinicians dictate using whatever means they prefer. We receive the dictation and transcribe it – without voice recognition or overseas processing – in the exact format you designate. Then we return the transcription to you in the form you specify. ZNF’s transcription is done by American medical transcriptionists. We do not use voice recognition, nor do we send work overseas. In addition, we do not pool work; we preserve the doctor-transcriptionist relationship. This ensures that you receive high-quality transcription each and every time. ZNF returns your transcription in the format you need. At the outset, we'll create templates for your account based on sample reports that you provide. You have complete control over the letterhead design, fonts, page layout, and other formatting aspects of your transcription. We distribute your documents via secure e-mail, fax, or system interface directly into your EMR or practice management system. ZNF also provides secure logins to permit approved individuals like referring physicians, insurance carriers, or attorneys with online access to select medical transcription files over the Internet. Our contact is simple! 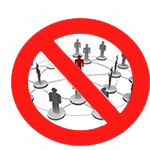 We have no setup fees, no equipment purchases, no minimum term, no minimum volume, no exclusivity. In short, your satisfaction is guaranteed. Is it hard to get your providers to keep up with their charts? ZNF Medical Transcription makes it easy to document the patient encounter. 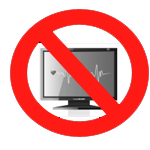 Wherever they may be, your clinical staff can dictate using almost any device: iPhone, iPad, EMR tablet, cell phone, hand-held recorder, traditional land-line, laptop computer. ZNF can transcribe files from whatever device is most convenient for them when they need it. To learn more, please visit our medical dictation page to review all of the available dictation options. 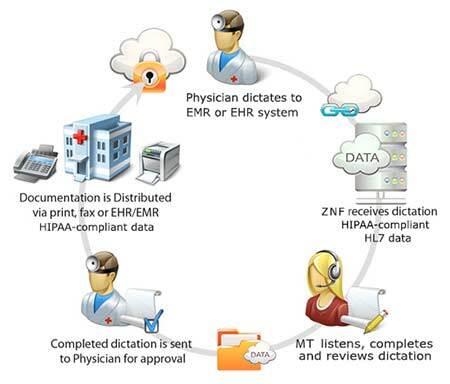 See the ZNF Medical Transcription process in action. Simply call in your dictation and we'll send you a sample transcription for free. Record your medical transcription trial now.